My husband and I both like olives, whether they be green or black. We add them to pizzas, casseroles, salads, and other dishes. Once in a while my husband will eat them straight out of the can. We recently discovered a new divergency of olives in the form of OLOVES. OLOVES are little snack packs of individual flavored olives. Each packet has approximately 10 to 13 natural green pitted olives, and they are only 50 calories. To enjoy the healthy snack, all you have to do is tear open the pack and pop them in your mouth. We enjoyed three flavors of OLOVES Olives. Lemon & Rosemary OLOVES are fresh green olives infused with rosemary and garlic. Tasty Mediterranean has a basil and garlic flavor. Basil & Garlic have a zing of basil and garlic. You can see there's a pattern of garlic in all three of those flavors, but it wasn't overwhelming or overpowering. My favorite flavor was Basil & Garlic but I enjoyed all three varieties. The majority of the olives were pitted, meaning there was no pit in them. I caught just a couple in the packages that had remainder of pits. If you don't consume an entire package of OLOVES at a time, refrigeration is recommended to keep them fresh. If you do this, the package isn't resealable. Each bag is liquid free, meaning you will only get tasty olives and no messy juices. 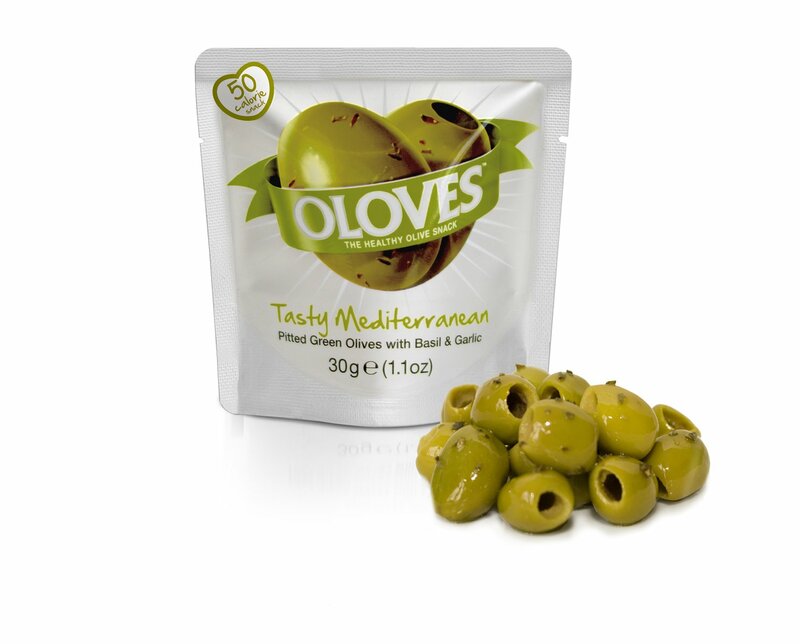 OLOVES Olives are a tasty snack to eat when on-the-go or when you want a bite to eat without consuming several calories. OLOVES are gluten-free, kosher, and vegan-friendly. One person will win thirty packs of OLOVES Olives in Basil & Garlic, Tasty Mediterranean, and Lemon & Rosemary. Mobile devices can help us stay on track when it comes to reaching goals. Whether it’s finding ways to stay healthy, finding new recipes to cook more or taking more photos to stay connected with friends and family, U.S. Cellular is sharing ways to help people reach their resolutions and to be able to create Better Moments for themselves and others in the New Year. The GS4, Samsung Galaxy Tablet, and iPad Air are wonderful mobile devices that can help you with resolutions. o Get fit: MyFitnessPal can help you stick to your workout regimen and stay motivated as you improve your fitness and get in shape. The app helps you create personalized workout programs and delivers progress reports as you work towards your personal goals. It also has a database of over 3,000,000 foods to help monitor your caloric intake and daily diet. MyFitnessPal can also connect you to your friends so that you can encourage each other and provide extra motivation. o Manage your finances: Looking to improve your money management? Mint analyzes your personal finance accounts and is a convenient way to track your spending, create budgets and start saving money. The app can even send you alerts regarding upcoming bills, unusual activity and low balances. o Improve your diet: Lose It! tracks your caloric intake and monitors your diet, helping you manage your weekly calorie budget and ensure that you are consuming the proper foods. It also integrates with sites such as Facebook and Twitter so you can stay updated on the progress your friends are making. o Learn something new: Ever wonder exactly how the stock market works or simply feel the need to brush up on your math skills? Khan Academy features an extensive library covering mathematics, biology, chemistry, physics, humanities, finance and history with easy to digest lessons taught by education experts. The app allows you to track your progress and earn badges while challenging yourself to become proficient in topics you might never thought you could have. o Stay in touch: After the holidays conclude, staying in touch with family can be difficult. But video communication apps such as Skype help shorten the perceived distance between our friends and family and provide the opportunity to create better moments with them. Skype provides the ability to have a face-to-face conversation with someone, even if they are hundreds of miles away. My New Year's resolutions are to be more physically fit and cut down on debt. Being in roller derby means I have to change my lifestyle and I want to feel more financially secure by the middle of the year. Using my U.S. Cellular mobile devices and downloading helpful apps will be beneficial in helping me reach my goals. What are your New Year's resolutions? How do you plan on using your mobile devices to meet your goals? Christmas day was very hard for our family. Our family dog, Cisco, passed away unexpectadly. I've shed several tears and come home expecting to see him greeting me at the door. I've learned the loss of a pet can evoke the same emotions as the loss of a friend or relative. A couple days after Cisco's passing, Jason started bringing up getting another dog. I wasn't much entertained by the thought. I couldn't fathom the thought of another pet coming in and taking over where Cisco left off. Well, I didn't get much of a choice. While I was at work yesterday, Jason made arrangements to bring a rescue pet home. (He seems to buy the most things or make the most plans when I'm not around!) When I found out, I was with mixed emotions. I still have a lot of raw grief. The grief is still there but, after seeing the pup, I can't be mad at Jason. He brought home the cutest german shepherd/beagle dog I've laid eyes on. And it's like she knew my concerns. She latched on to me from the get-go. Of course my hands will be super full now that I'm taking care of a 3 month old dog. But she's already melted my heart. Holly is not a replacement, but she's now a welcome addition. I don't normally beg for votes, "likes", or money (really, normally I don't) but I'm throwing one out there. As most of you know I'm now a member of the DRDC (Dark River Derby Coalition), the local roller derby team. Right now it's off-season so I haven't been able to bout yet but the team of derby girls is about much more than putting on their skates and beating other girls up. It's also about raising money and awarness for charities. In fact, any proceeds or admission prices that DRDC raises during bouts goes right back to charity. We dump a lot of money, but make none. To put our name out there and to most importantly raise money for a special cause I have joined up with some of the other derby girls to take the plunge. The Polar Plunge that is! On February 22nd we will be braving the freezing weather and jumping into frigid waters. Any and all proceeds raised will go to the Special Olympics. I have committed to “be bold and get cold” for the athletes of Special Olympics Illinois by taking an icy dip into the frigid winter waters! I know – you’re probably getting cold just thinking about it! While the cold I will experience is temporary, the positive impact this will have on the lives of Special Olympics athletes across Illinois will last a lifetime. I need your help! No, I’m not asking you to plunge alongside me, but I hope you will support my efforts by making a donation to Special Olympics Illinois. Any amount is appreciated – it all goes to one “cool” cause and gets me that much closer to my goal. Best of all, your donation helps provide athletes with intellectual disabilities the chance to participate in year-round sports training and competition. Donating through my Polar Plunge site is simple, fast and totally secure. It is also the most efficient way to make a contribution to the Polar Plunge for Special Olympics Illinois. I've also posted a widget on the top right hand side of my blog that will direct you to my Polar Plunge page. Any amount is greatly appreciated. If you would like to learn more about this “official event of winter,” visit www.plungeillinois.com for all of the chilly details. Again, I'm not one to usually ask for things like this so boldly but it's for a wonderful cause. Any monetary amount is appreciated. I promise to post pics of us crazy derby girls braving the elements and taking the plunge. And I'd be eternally grateful. I swore it would never happen again but what do you know, it did. I can't help but give my co-workers a chance to weigh in on the hot topics in life through my blog. I am lucky that I have such wonderful co-workers that sometimes they take it easy on me and just give me a warning! Everyone have a lovely day!!! I received products for review from Coffee-mate. The opinions within this post are of my own and I was not influenced in any way. Please do your own research before purchasing products or using services. Your opinions and results may differ. It doesn’t take a lot to brighten our days. It’s the enjoyment we get when reading a great book, having a heart-to-heart with a close friend or taking a crisp autumn walk - some of life’s greatest moments are the simplest ones. Just as Coffee-mate Natural Bliss is made with only four natural ingredients and brings simple pleasures to every cup. The ingredients are milk, cream, sugar, and natural flavor. Coffee-mate natural bliss®currently comes in five delicious varieties that allow you to add your flavor, naturally: Sweet Cream, Cinnamon Cream, Vanilla, Low Fat Vanilla, and Low Fat Chocolate. By going to the Coffee-Mate Natural Bliss Facebook Page, you can save $0.55 when you buy any one NESTLÉ® COFFEE-MATE® NATURAL BLISS® liquid creamer. My favorite simple moment is coffee with Natural Bliss and a good book. Spending some time by myself indulging in coffee with Natural Bliss and getting swept away by a well written storyline takes me away from the busyness of a hectic schedule. What's your favorite simple moment with Coffee-mate Natural Bliss? One person will win a Coffee-mate Natural Bliss prize pack that includes a reduced value coupon for Natural Bliss, a $5 Target gift card, a coffee tumbler, a vanilla bean scented candle, and Italian Biscottie cookies. Twisted Shoes is an up-and-coming shoe line exclusively for the fashion obsessed. Twisted Shoes designs and develops stylish and affordable women's footwear at a low price. Their wide range includes flats, loafers, pumps, high heels, and many more. Although I wear different styles of footwear, my main preference is shoes that are comfortable and versatile. I received two pair of footwear from Twisted Shoes, with one being the Twisted Womens Toner Athletic Stylish Shape up Sneaker. Black and pink in color, these sneakers are termed Shape-Ups because they're considered a workout sneaker that tones. I've heard both pros and cons of Shape Up sneakers and whether or not they're beneficial to a workout. I'm not here to argue one way or the other. The soles are thicker than most sneakers. I wear these on an almost daily basis because they're comfortable and cute. I can wear them all day without my feet hurting and they are true to size. I like the color combination of black and pink and the soles have good traction. The shoes are made of faux leather and have black shoelaces. I also received the Twisted Womans Champion Sequin Boat Shoe. Made of canvas, these shoes are available in four colors. The color I have is cordovan which closely resembles red. These shoes run a little big in size so I have to wear socks with them to keep them from slipping off. Other than that, they are chic and comfortable. The inside is red and white striped while the outside is red and has a sequin overlay, putting off a flashy appeal. Overall, I'm impressed with the two pair of footwear from Twisted Shoes and would definitely consider getting more of their shoes in different colors and styles. Family Guy reaches new heights of hilarity in this outrageous collection of 22 uncensored episodes, including fan-favorite Into Fat Air, where the Griffins rock Mount Everest, plus the comedy jackpot Roads to Vegas and the milestone 200th episode Yug Ylimaf, in which Brian and Stewie develop a curious case of reverse aging thanks to a time machine foul-up. It's a complete season of laughs with celebrity guest voices Johnny Depp, Jon Hamm, Sofia Vergara and more! Family Guy: Volume 12 was released to DVD by 20th Century Fox Home Entertainment on December 17, 2013. It's rude. It's crude. It's full of gags. It's Family Guy. I've been a fan of Family Guy since the beginning. There's rarely an episode I don't like and it's full of adult entertainment. This volume contains a lot of time travel with Stewie and Brian which is okay but I like seeing episodes with the entire family involved. Although Family Guy is a cartoon, it's not suitable for kids. There's cartoon violence, hardly any political correctness, and some raunchy behavior. Family Guy knows no boundaries and pokes fun of everyone. And, for the most part, I love it! Family Guy continues to evolve and it allows me time to sit back and watch mindless and creative entertainment. Allyson has super curly, long hair. She got the curls from her daddy. Allyson doesn't mind experimenting with new hair products, but has to be careful. If Allyson uses the wrong products on her hair it's a definite recipe for kink and frizz. If she uses the right products, her curly locks shine through and it's beautiful. I recently received the Philip B. Our Royal Mega-Curl Enhancer for review and Allyson's been using it on her locks. The 6 fl oz tube comes in with a hefty price tag of $50 but it works. The curl enhancer is designed to lock in time-released moisture for supple definition and high shine. Nourishing amino acids and botanical extracts boost color retention and calm flyaways. Super-moisturizing agents tame frizz and leave hair bouncy and shiny for days. It is Paraben & Phthalate Free and has a woodsy scent. Allyson swears by this product and says it helps her head of curls feel softer and bouncier. She runs a quarter-size amount through damp hair, then blow drys her head. I don't have curly hair but wanted to try the Philip B. Our Royal Mega-Curl Enhancer myself. It did not create any waves or curls but I have high compliments for this product too. My hair is so much softer and manageable when I apply some of this formula to my hair. Allyson and I have found that this mega-curl enhancer works wonders on curly hair by bringing back bounce, adding softness, and preventing kink. It also works on straight hair by giving striking softness and tamenss. As I mentioned Christmas day, our family dog Cisco passed away. Christmas was extremely hard on all of us. We shed tears till we couldn't anymore, then we shed some more. I've always joked with Jason that he couldn't possibly have any tear ducts because I've never seen him cry in the twelve years I've been with him. Cisco's passing broke him down and he cried and grieved hard like the rest of us. Jason spared me the brutality of coming home from work and seeing Cisco as he was so he called the vet and took him early in the morning for cremation. Jason and his "best friend" took one last ride together to the vet and Jason said his goodbyes. We will not be receiving any of Cisco's ashes but Jason made sure to take off Cisco's collar as a memento. It's the same collar that's never been taken off since the day we got him. The kids have requested that I make a photo book of pictures of our dog so we can look back and remember the great times. I never imagined losing a pet would be so freakin' hard. That dog was us, a part of our family. And it's harder not knowing why he passed so suddenly. They say all dogs go to Heaven and I'm positive Cisco is up there now shedding hair all over the place and getting tons of attention. I guess Jesus wanted Cisco to share his birthday with Him. This picture is one of the last we have of Cisco. It was taken on Dec. 23rd when the kids were opening their Christmas gifts. The winner of The Ultimate Life DVD giveaway is #77, Kathy D.
The winner of the See Jane Work giveaway is #13, Lissa C.
The winner of the ZombieRescueStation.com giveaway is #25, mummytotwoboys. The winner of the Nacho Mama Tees giveaway is #151, pmj. Congrats to the winners and thanks to all who entered. If you haven't already, be sure to check out my list of active giveaways on the top left hand side of my blog. There's no limit to how many you can enter or how many you can win. Say what you will, but I like dolls. I'm not one of those people you'll see on TV one day dressing her dolls and having a collection lined wall to wall (pinky swear). But I have a slight fascination with dolls that are unconventional and quirky. I have about ten of them and recently added Ainsley of The Beatrix Girls. The Beatrix Girls is a new line of collectible pop-star dolls driven by original music. The Beatrix Girls' message is to empower and inspire young girls throughout the country through their music, fashion and goal-oriented lifestyle. The four band members of The Beatrix Girls includes Brayden, Ainsley, Lark, and Chantal. Kids can interact by collecting their music and joining their fan club. Ainsley is a perfect doll for my collection. She's the drummer of the bunch and is rockin' in her pink dress, black fishnet stockings, and black high heels. She's posable so she can be made to sit down or stand up, although she stays in place much more well if she's sitting down. She has big blue doe eyes and soft blonde hair. I like her style and the message behind her music. The Beatrix Girls retail for $24.99 each without an instrument. The doll I have didn't come with a drum set which was a little disappointing because it would've completed the ensemble. Dolls with instruments and stands can be purchased at select Justice stores for $34.99. Included with The Beatrix Girl doll I received was a code to register online and become a VIP Trixie. I let Emma, my youngest step-daughter, take care of that deal and she was able to download all five songs of The Beatrix Girls. She was also able to watch all of The Beatrix Girls webisodes. I listened to the music and checked out a couple of the webisodes and was dazzled by the positive messages and upbeat attitudes. The Beatrix Girls music is also available on iTunes and Amazon. The Beatrix Girls know how to rock, with style! One person will win choice of The Beatrix Girls doll. Christmas at our house was celebrated yesterday, the 23rd. Having a blended family means that kids are going from one house to another during the holidays. Rather than try to fight the situation, we get them all together on the 23rd and open gifts. It was a beautiful evening. First we went to Logan's basketball game. He scored 8 points! #15, yep that's my boy! Then we headed back to the house to open gifts. I got a personalized calendar, pair of thermal pants, a Christian verse wall hanging, and a Monster High doll. Yes, a doll...don't judge! The rest of the evening was spent playing Twister Dance Rave and eating lots of pizza. I wasn't necessarily in the Christmas spirit before then, but seeing the kids open their gifts and everyone getting along so wonderfully made me uber happy. Here's wishing you and yours a wonderful and blessed Christmas! This touching story of hope and family values is the follow-up to the heartwarming film and best-seller The Ultimate Gift. After receiving life-changing gifts from his grandfather, Jason Stevens finds himself in need of guidance once again. Jason’s billion dollar foundation is being challenged in a courtroom battle, which complicates his relationship with his soul mate. When it looks like he may lose it all, he finds his grandfather’s journal. With everything he loves hanging in the balance, he embarks on a journey into the past through the journal to learn what it means to live...The Ultimate Life. 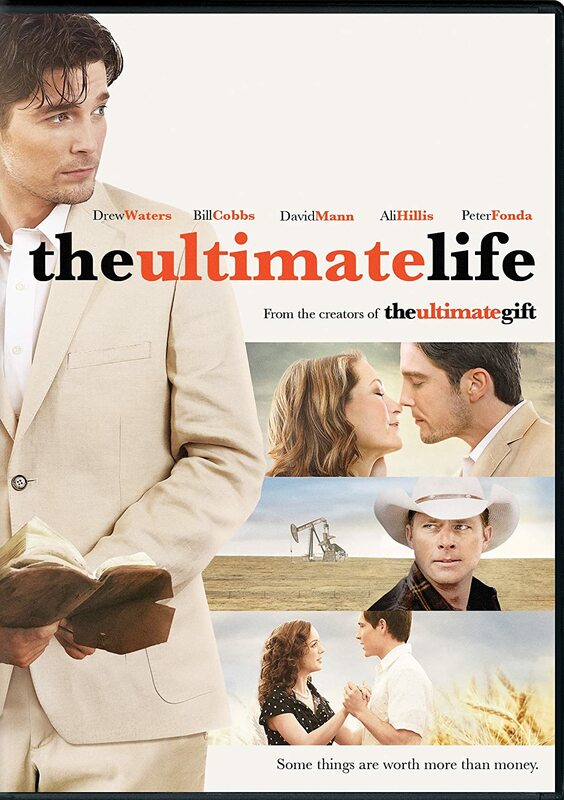 Based on Jim Stovall's novel with the same name, The Ultimate Life carries on from the first book and movie, The Ultimate Gift. Although I've read The Ultimate Gift and watched the movie, it's not necessary to do either to catch on to the meaning and plot of The Ultimate Life. This movie stars Drew Waters who plays Jason, a grandson who received property and valuable lessons when his grandfather passed away. Now the estate is being challenged in court by family and Jason's girlfriend leaves for a different country. Jason is downtrodden and turns to an elderly gentleman for help. Jason receives his grandfather's journal and viewers are taken back in time to when Red (the grandfather) learned his valuable life lessons. It gives Jason perspective and insight. If there's ever a movie that will leave you pondering your life and the important things in it, this is it. Although I thoroughly enjoyed the book of the same name, I liked the movie more because I was able to delve deeper into the characters' backgrounds and feelings. I recently did a review for Dearfoams on a pair of their men's slippers. Jason has worn the slippers quite frequently and is happy for the comfortable warmth on his feet. Let me tell you, I was giddy when I received a pair in the mail for myself. I've heard of the Dearfoams brand before but had never worn a pair, until now. Jason and I now understand what all the rave is about. For those not in the know, Dearfoams is a long-standing company that specializes in slippers and sleepwear. I received the foil pile bootie slippers in pink. And boy, are they pink! I'm positive these slippers won't go unnoticed on anyone's feet. I like the bright boldness of the color and the fuzziness of the material. The material on the outside of the slippers have faux rabbit pile with metallic foil print. The inside is made of faux rabbit pile. This makes the slippers look like a big fuzzy ball of fur and shine. The metallic foil dotted throughout the booties give them a subtle shine. The black puff print soles are soft. I wear a size 10 in footwear and ordered a large (size 9-10) in the bootie slippers. Although they do fit, they'd be more agreeable if they were a tad bit bigger. My feet fit fine in them for the most part but my heels are right on the back edge seam. The slippers are super comfortable and are easy to slip on and off. I wear them often around the house for warmth and snugness. If Santa Claus had boots that let water in when he stepped in puddles, would Mrs. Claus really have to give up her Christmas money to bail him out? If he had cold feet for awhile, maybe he would work a little harder on the 364 other days of the year instead of only working one day for free! Santa may be always watching, but watching what? Duck Dynasty? Nascar? Did little Pontius Pilate really break the wing of that Christmas Cardinal or was he really innocent? Making gourds look like people isn't really normal is it? Can shin splints somehow be Karmic justice? Happy holidays! From now until January 7th, 2014 you can enter to win the Jockey International Burgundy's Briefs and Movie Sweepstakes on Facebook. Fifty first prize winners will receive a coupon code for purchase of one pair of Jockey &-Front low-rise briefs. ARV: $18 each. Fifty second prize winners will receive two movie tickets to see "Anchorman 2 The Legend Continues". ARV: $23 each. I'm not the first to say this, but it's important to remember that there's no weight loss pill on the market that will work if you don't incorporate proper diet and exercise into your regimen. Popping pills while sitting on the couch and expecting results just isn't going to work. With that said, I believe that some (not all) dietary supplements can help aid in achieving weight loss. My lifestyle has changed somewhat in the past two months. Due to joining roller derby, I've been forced to be more conscious of what I eat and have been exercising on a regular basis. I've also been using Svetol Slimming Green Coffee Bean Extract. This bottle of 500mg pills is a dietary supplement that is clinically shown to support healthy metabolism and weight loss. I take two pills a day, one in the morning and one in the evening. They are in capsule form and brown in color. To give you a little more insight on how these pills work, Svetol® is a powerful, decaffeinated green coffee bean extract.. Green, unroasted coffee beans are rich in chlorogenic acids, key compounds that support the body's metabolism. This ingredient supports healthy weight in two ways: by slowing the absorption of glucose in the intestines, and modulating the breakdown of sugar by the liver which encourages the burning of fat for energy. When glucose levels are balanced, a person is less likely to experience the highs and lows that can lead to cravings for sweets and other empty calories. Svetol® also supports the body’s metabolism, so individuals are more likely to experience the benefits of exercise and diet efforts. It has been clinically shown to support lean body mass so the body can more effectively and efficiently use the calories from a healthy diet. Since taking Svetol Slimming Green Coffee Bean Extract, combined with proper diet and exercise, I've lost a few pounds. Personally, I've had no side effects or jitters from taking these capsules. I feel they've been advantageous in helping me lose the weight. One person will win a bottle of Svetol Slimming Green Coffee Bean Extract. Trigger Happy, the creators of the animated storytelling app, Toon Hero, teamed up with the popular lifestyle brand, SO SO Happy, which taps into young people’s universal desire for love, acceptance, and respect, to release limited edition holiday-themed characters and props for people of all ages as part of their 12 days of Christmas campaign. Combining the spirit of the holidays and the quirky characters of SO SO Happy, users can send holiday greetings, stories, jokes and more without any training or artistic ability. Christmas Limited edition characters include: · Ozzie · Lucky · Taco · Puff · Tribe · Props Characters will be available for 99 cents from today through Christmas. Other exclusive characters and properties that are already available on Toon Hero include: Valve’s Portal 2, The Jim Henson Company, Hero: 108, Mukpuddy, and National Geographic among others. Toon Hero is available in 14 different languages and free to download from the App Store on iPad or at https://itunes.apple.com/us/app/toon-hero/id581413681?ls=1&mt=8. For more information about Toon Hero, please visit: www.toonhero.com. For more information about SO SO Happy, please visit: www.sosohappyonline.com. Three people will each win a Toon Hero prize pack that includes journals, stickers, buttons, and a Toon Hero tote. The new winner of The Secret World of Santa Claus DVDs giveaway is #120, LesleyfromWI. The winner of the scunci Hair Accessories giveaway is #158, gahome2mom. The winner of the Bl-ray #MovieMagic giveaway is #261, CindyWindy2003. The winner of the Crazy Dog Tshirts giveaway is #293, Melina. The winner of the Dean's Sweets giveaway is #128, Anne N.
The winner of the ToiletTree giveaway is #26, latanya t.
The winner of the Percy Jackson giveaway is #207, Sacha S.
The two winners of the Ruth's Toffee giveaway are #284, Lissa C. and #362, Sara W.
The winner of the Dearfoams Slippers giveaway is #452, Michelle U.
Congrats to the winners and thanks to all who entered. Be sure to enter my current giveaways, if you haven't already. Some are ending real soon. There's no limit to how many you can enter or how many you can win. Katy Perry is a celebrity I admire for her vocals and unique style. I think she does a superb job in her line of work. Katy has two fragrances in her perfume line, with the newest being Katy Perry Killer Queen. This new regal scent is a mix of luscious notes fit for royalty. Katy Perry Killer Queen has top notes of dark plum, wild berries, and bergamot. Middle notes are made up of red velvet flower, rainbow plumeria, and natural jasmine sambac. Bottom notes are made up of cashmeran, natural patchouli heart, and liquid praline. I'll admit I don't know exactly what some of those additives are but the overall fragrance is appealing to the senses. The fragrance comes in a jewel shaped bottle with an ornamental gold cap, giving it a look of regal semblance. The boxed packaging the perfume comes in is red with a quilted diamond look. This lavish perfume would be great for those who are fans of Katy Perry or those who just like the stimulating scent of a fine perfume. Capturing special and memorable holiday moments is easy with Instagram and Vine apps that can be downloaded on your U.S. Cellular smartphone / tablet. Mobile devices help us communicate more frequently, share experiences immediately, and generally enrich the quality of our relationships. Whether at home or on-the-go, U.S. Cellular is providing the tools needed to help consumers create, discover, enhance and share life’s Better Moments with their families. Share holiday recipes. Let your friends and family see the behind-the-scenes work as you whip up your favorite holiday meals or desserts. Recipes on Vine and Instagram often show preparation or presentation tutorials. Send holiday messages. Calling your loved ones is always important, but try mixing in personalized Vine or Instagram videos you can send and tag them in. With access to U.S. Cellular’s high-speed nationwide network, you can upload and share your greetings quickly, even if you’re away on a holiday vacation. Show off holiday lights. Bring the photos of holiday lights strung around your home or neighborhood to life by making a video of them. You could start a time lapse video of you putting them in place or showcase any special effects. Follow hashtags for promotions. There are a number of brands that utilize Vine and Instagram to promote their products or specials, especially around the holidays. Search for their verified accounts and see what they have to offer. Some brands even ask their users to create videos based on one of their hashtags, so they can select winners to claim prizes. Gift Under $25 – Accessories are essential for your smartphone or tablet. A case, shell, skin or travel charger makes a great stocking stuffer. Examples include the Ballistic LS Jewel Gel Skin in purple or grey. Gift Under $50 – Gift a U.S. Cellular Bluetooth Headset for the multi-tasker who’s constantly working to do more. Gift under $100 – Gift the Griffin TC Monster Truck for the adventurer in your life, you can control the truck with a virtual dashboard or tilt your device to steer. iPhone 5s or 5c – the new iPhone is one of the hottest tech gifts this shopping season. U.S. Cellular offers iPhone 5s, the most forward-thinking smartphone in the world, and iPhone 5c the most colorful iPhone yet. Use your iPhone to connect with family and friends this holiday season by taking photos with the advanced iSight camera system and video chatting via and FaceTime. I received compensation for this post. The opinions within this post are of my own and I was not influenced in any way. Please do your own research before purchasing products or using services. Your opinions and results may differ. This post contains embedded video. The new Herbal Essences Naked Collection Volume Kit is now available online at Walmart and will be available the week of January 6th in store. This kit includes Naked Volume Shampoo,Conditioner, Volumizing Soufflé Styler, and Dry Shampoo. I just ordered the kit online at Walmart.com and have included a short video about the ordering process. In a few weeks I'll be sharing my personal review of the Herbal Essences Naked Collection Volume Kit. One person will win a $50 Walmart Gift Card.